Having seen some of the spectacularly beautiful natural wonders in South America, I came home feeling inspired. As is usually the case after returning from a trip abroad, I find a renewed appreciation for the natural world closer to home. I started visiting the nearby National Parks, State Parks and Regional Parks again and re-discovering Northern California as an excellent travel destination. Aside from the obvious popular tourist destinations like San Francisco and the Wine Country, Northern California has so much to offer the nature lovers and active travelers. You can find scenic walking and hiking trails, world class ‘birding’ destination, one of the biggest elephant seal colonies in the world, lighthouses that are perched on top of a cliff as opposed to seal-level as in most lighthouses, beaches and world class surfing destinations (as in “the Mavericks*”, which I did not get to see). While I enjoyed the spectacularly beautiful scenery and local wildlife and ocean beach and coastal trails and was inspired to blog and write excessively as you can see from the pages and pages I posted on this travel blog, I am saddened to report that the drought in Northern California is threatening our local wildlife refuge. I thought I would never say the cliché, “the grass is greener on the other side,” but sadly, it is literally the case in Northern California. Coyote Hills Regional Park spans across three cities: Union City, Newark, and Fremont, across Silicon Valley, the east end of Dumbarton Bridge. It has hiking trails where you can see scenic views of the marshes from the boardwalk and San Francisco Bay and southern Alameda from the hills, and paved biking trail, which connects with Alameda Creek Trail to the Don Edwards San Francisco Bay National Wildlife Refuge and eastward to the Fremont’s Niles District. The history of this area is rich [You can Wikipedia or google it for additional information]. I just wanted to give a brief description of the hiking trails, which lead out into a wildlife refuge that is stopovers for migratory waterfowl, shorebirds, songbirds, and raptors on the Pacific Flyway. The park provides excellent opportunities for birdwatchers. 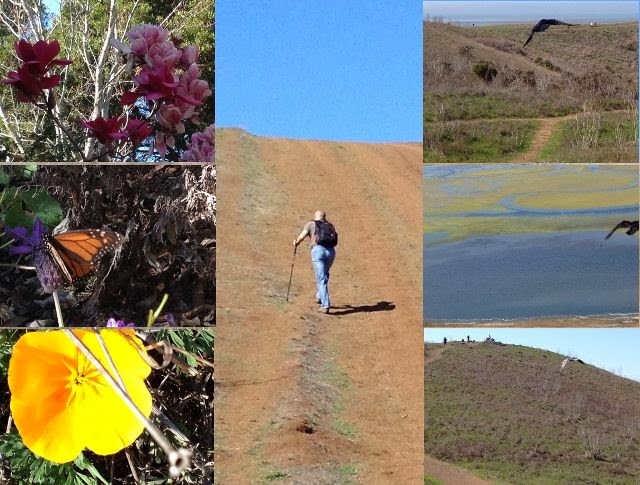 We hiked the Coyote Hills Trail on Sunday last week (Feb 23). Before going up the hill, we decided to stop by the nectar garden and see the butterflies. We only saw a couple of butterflies and a few tiny red and black beetles and noticed through the beautiful purple blooms that spring has sprung early. I was admiring the beautiful purple bloom when I realized very little greens contrasted with the burnt gold of dry grasses that lined our path. When we got to the top of the hill, I was astounded to see the view of the dried creek and marshes down below and realized how bad the drought was. We revisited our hike on Saturday, Mar 1 after two days of heavy rains. What a difference two days of rain make! And we need more. * Mavericks is a big-wave surfing location in Northern California. It is located approximately 2 miles from shore outside Pillar Point Harbor, just north of the town of Half Moon Bay at the village of Princeton-by-the-Sea.